Online SIC Code List is shown below. 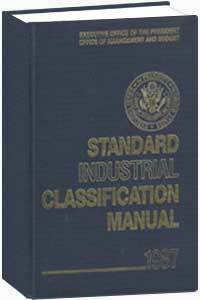 The Standard Industrial Classification, or “SIC” system, is used for classifying industries by a four-digit numeric code. This method was established in the United States in 1937. The SIC classification system is used by government and private agencies to classify industry areas. Although he Standard Industrial Classification system has not been updated since 1987, the system is still widely used. Need a copy of this SIC Code list? You can download this list in excel format by clicking SIC-Code-List.xls, or by clicking the image to the right. *Disclaimer: For an authoritative SIC Code List, please obtain directly from Osha.gov, or siccode.com. 2023 Dry, Condensed, and Evaporated Dairy Product Mfg. 2024 Ice Cream and Frozen Dessert Mfg. 2032 All Other Misc. Food Mfg. 2034 Dried and Dehydrated Food Mfg. 2034 Frozen Fruit, Juice, and Vegetable Mfg. 2037 Frozen Fruit, Juice, and Vegetable Mfg. 2038 Frozen Specialty Food Mfg. 2047 Dog and Cat Food Mfg. 2048 Other Animal Food Mfg. 2051 Frozen Cakes, Pies, and Other Pastries Mfg. 2052 Cookie and Cracker Mfg. 2068 Roasted Nuts and Peanut Butter Mfg. 2087 Flavoring Syrup and Concentrate Mfg. 2087 Spice and Extract Mfg. 2087 All Other Misc. Food Mfg. 2095 Coffee and Tea Mfg. 2096 Other Snack Food Mfg. 2099 All Other Misc. Food Mfg. 2099 Roasted Nuts and Peanut Butter Mfg. 2099 Mayonnaise, Dressing, and Other Prepared Sauce Mfg. 2099 Perishable Prepared Food Mfg. 2099 Spice and Extract Mfg. 2321 Men’s and Boys’ Cut and Sew Apparel Mfg. 2323 Apparel Accessories and Other Apparel Mfg. 2326 Men’s and Boys’ Cut and Sew Apparel Mfg. 2329 Men’s and Boys’ Cut and Sew Apparel Mfg. 2331 Women’s, Girls’, and Infants’ Cut and Sew Apparel Mfg. 2353 Apparel Accessories and Other Apparel Mfg. 2371 Other Cut and Sew Apparel Mfg. 2381 Apparel Accessories and Other Apparel Mfg. 2389 Other Cut and Sew Apparel Mfg. 2389 Apparel Accessories and Other Apparel Mfg. 2396 Apparel Accessories and Other Apparel Mfg. 2426 All Other Misc. Wood Product Mfg. 2429 All Other Misc. Wood Product Mfg. 2431 Wood Window and Door Mfg. 2434 Wood Kitchen Cabinet and Countertop Mfg. 2435 Hardwood Veneer and Plywood Mfg. 2436 Softwood Veneer and Plywood Mfg. 2439 Engineered Wood Member (Except Truss) Mfg. 2441 Wood Container and Pallet Mfg. 2448 Wood Container and Pallet Mfg. 2449 Wood Container and Pallet Mfg. 2449 All Other Misc. Wood Product Mfg. 2451 Manufactured Home (Mobile Home) Mfg. 2452 Prefabricated Wood Building Mfg. 2493 Reconstituted Wood Product Mfg. 2499 All Other Misc. Wood Product Mfg. 2499 Wood Container and Pallet Mfg. 2499 All Other Misc. Mfg. 2511 Custom Architectural Woodwork and Millwork Mfg. 2511 Nonupholstered Wood Household Furniture Mfg. 2514 Metal Household Furniture Mfg. 2517 Nonupholstered Wood Household Furniture Mfg. 2519 Household Furniture (Except Wood and Metal) Mfg. 2521 Wood Office Furniture Mfg. 2522 Office Furniture (Except Wood) Mfg. 2531 Office Supplies (Except Paper) Mfg. 2591 Blind and Shade Mfg. 2652 Other Paperboard Container Mfg. 2653 Corrugated and Solid Fiber Box Mfg. 2655 Other Paperboard Container Mfg. 2656 Other Paperboard Container Mfg. 2657 Folding Paperboard Box Mfg. 2671 Paper Bag and Coated and Treated Paper Mfg. 2671 Plastics Packaging Film and Sheet (Including Laminated) Mfg. 2672 Paper Bag and Coated and Treated Paper Mfg. 2673 Plastics Bag and Pouch Mfg. 2673 Paper Bag and Coated and Treated Paper Mfg. 2674 Paper Bag and Coated and Treated Paper Mfg. 2675 Paper Bag and Coated and Treated Paper Mfg. 2676 Sanitary Paper Product Mfg. 2679 All Other Converted Paper Product Mfg. 2679 Paper Bag and Coated and Treated Paper Mfg. 2812 Other Basic Inorganic Chemical Mfg. 2816 Synthetic Dye and Pigment Mfg. 2819 All Other Misc. Chemical Product and Preparation Mfg. 2819 Other Basic Inorganic Chemical Mfg. 2821 Plastics Material and Resin Mfg. 2823 Artificial and Synthetic Fibers and Filaments Mfg. 2824 Artificial and Synthetic Fibers and Filaments Mfg. 2833 Medicinal and Botanical Mfg. 2835 In-Vitro Diagnostic Substance Mfg. 2836 Biological Product (Except Diagnostic) Mfg. 2841 Soap and Other Detergent Mfg. 2842 Polish and Other Sanitation Good Mfg. 2843 Surface Active Agent Mfg. 2851 Paint and Coating Mfg. 2861 Cyclic Crude, Intermediate, and Gum and Wood Chemical Mfg. 2865 Cyclic Crude, Intermediate, and Gum and Wood Chemical Mfg. 2865 Synthetic Dye and Pigment Mfg. 2869 All Other Basic Organic Chemical Mfg. 2875 Fertilizer (Mixing Only) Mfg. 2879 Pesticide and Other Agricultural Chemical Mfg. 2899 All Other Misc. Chemical Product and Preparation Mfg. 2899 Spice and Extract Mfg. 2951 Asphalt Paving Mixture and Block Mfg. 2952 Asphalt Shingle and Coating Materials Mfg. 2992 Petroleum Lubricating Oil and Grease Mfg. 2999 All Other Petroleum and Coal Products Mfg. 3052 Rubber and Plastics Hoses and Belting Mfg. 3053 Gasket, Packing, and Sealing Device Mfg. 3069 All Other Rubber Product Mfg. 3069 All Other Plastics Product Mfg. 3081 Unlaminated Plastics Film and Sheet (Except Packaging) Mfg. 3082 Unlaminated Plastics Profile Shape Mfg. 3083 Laminated Plastics Plate, Sheet (Except Packaging), and Shape Mfg. 3084 Plastics Pipe and Pipe Fitting Mfg. 3086 Urethane and Other Foam Product (Except Polystyrene) Mfg. 3086 Plastics Pipe and Pipe Fitting Mfg. 3086 Polystyrene Foam Product Mfg. 3088 Plastics Plumbing Fixture Mfg. 3089 All Other Plastics Product Mfg. 3131 All Other Leather Good and Allied Product Mfg. 3151 Apparel Accessories and Other Apparel Mfg. 3161 All Other Leather Good and Allied Product Mfg. 3171 Women’s Handbag and Purse Mfg. 3172 All Other Leather Good and Allied Product Mfg. 3199 All Other Leather Good and Allied Product Mfg. 3229 Other Pressed and Blown Glass and Glassware Mfg. 3251 Clay Building Material and Refractories Mfg. 3253 Clay Building Material and Refractories Mfg. 3255 Clay Building Material and Refractories Mfg. 3261 Pottery, Ceramics, and Plumbing Fixture Mfg. 3263 Pottery, Ceramics, and Plumbing Fixture Mfg. 3264 Pottery, Ceramics, and Plumbing Fixture Mfg. 3269 Pottery, Ceramics, and Plumbing Fixture Mfg. 3271 Concrete Block and Brick Mfg. 3272 Other Concrete Product Mfg. 3281 Cut Stone and Stone Product Mfg. 3291 All Other Misc. Fabricated Metal Product Mfg. 3292 All Other Misc. Nonmetallic Mineral Product Mfg. 3295 Ground or Treated Mineral and Earth Mfg. 3297 Clay Building Material and Refractories Mfg. 3299 All Other Misc. Nonmetallic Mineral Product Mfg. 3312 All Other Petroleum and Coal Products Mfg. 3312 Iron and Steel Mills and Ferroalloy Mfg. 3313 Iron and Steel Mills and Ferroalloy Mfg. 3315 Other Fabricated Wire Product Mfg. 3316 Rolled Steel Shape Mfg. 3353 Aluminum Sheet, Plate, and Foil Mfg. 3357 Fiber Optic Cable Mfg. 3357 Other Communication and Energy Wire Mfg. 3412 Other Metal Container Mfg. 3421 Metal Kitchen Cookware, Utensil, Cutlery, and Flatware (Except Precious) Mfg. 3421 Saw Blade and Handtool Mfg. 3423 Saw Blade and Handtool Mfg. 3425 Saw Blade and Handtool Mfg. 3431 All Other Misc. Fabricated Metal Product Mfg. 3432 Plumbing Fixture Fitting and Trim Mfg. 3433 Heating Equipment (Except Warm Air Furnaces) Mfg. 3441 Fabricated Structural Metal Mfg. 3442 Metal Window and Door Mfg. 3443 Power Boiler and Heat Exchanger Mfg. 3443 Metal Tank (Heavy Gauge) Mfg. 3444 Sheet Metal Work Mfg. 3446 Ornamental and Architectural Metal Work Mfg. 3448 Prefabricated Metal Building and Component Mfg. 3449 Fabricated Structural Metal Mfg. 3451 Precision Turned Product Mfg. 3452 Bolt, Nut, Screw, Rivet, and Washer Mfg. 3469 Metal Kitchen Cookware, Utensil, Cutlery, and Flatware (Except Precious) Mfg. 3469 Powder Metallurgy Part Mfg. 3482 Small Arms Ammunition Mfg. 3483 Ammunition (Except Small Arms) Mfg. 3484 Small Arms, Ordnance, and Ordnance Accessories Mfg. 3489 Small Arms, Ordnance, and Ordnance Accessories Mfg. 3492 Fluid Power Valve and Hose Fitting Mfg. 3495 Other Measuring and Controlling Device Mfg. 3497 All Other Misc. Fabricated Metal Product Mfg. 3497 Paper Bag and Coated and Treated Paper Mfg. 3498 Fabricated Pipe and Pipe Fitting Mfg. 3499 All Other Misc. Fabricated Metal Product Mfg. 3511 Turbine and Turbine Generator Set Units Mfg. 3519 Other Engine Equipment Mfg. 3523 Farm Machinery and Equipment Mfg. 3524 Lawn and Garden Tractor and Home Lawn and Garden Equipment Mfg. 3532 Mining Machinery and Equipment Mfg. 3533 Oil and Gas Field Machinery and Equipment Mfg. 3534 Elevator and Moving Stairway Mfg. 3535 Conveyor and Conveying Equipment Mfg. 3536 Overhead Traveling Crane, Hoist, and Monorail System Mfg. 3537 Industrial Truck, Tractor, Trailer, and Stacker Machinery Mfg. 3543 All Other Misc. Wood Product Mfg. 3543 All Other Misc. Fabricated Metal Product Mfg. 3544 Saw Blade and Handtool Mfg. 3544 Special Die and Tool, Die Set, Jig, and Fixture Mfg. 3545 Cutting Tool and Machine Tool Accessory Mfg. 3547 Rolling Mill and Other Metalworking Machinery Mfg. 3552 Other Industrial Machinery Mfg. 3553 Sawmill, Woodworking, and Paper Machinery Mfg. 3554 Sawmill, Woodworking, and Paper Machinery Mfg. 3555 Printing Machinery and Equipment Mfg. 3556 Food Product Machinery Mfg. 3559 Other Industrial Machinery Mfg. 3561 Pump and Pumping Equipment Mfg. 3562 Ball and Roller Bearing Mfg. 3563 Air and Gas Compressor Mfg. 3564 Industrial and Commercial Fan and Blower and Air Purification Equipment Mfg. 3566 Speed Changer, Industrial High-Speed Drive, and Gear Mfg. 3567 Industrial Process Furnace and Oven Mfg. 3568 Mechanical Power Transmission Equipment Mfg. 3575 Computer Terminal and Other Computer Peripheral Equipment Mfg. 3579 Computer and Peripheral Equipment Mfg. 3581 Other Commercial and Service Industry Machinery Mfg. 3582 Other Commercial and Service Industry Machinery Mfg. 3585 Air Conditioning and Warm Air Heating Equipment and Commercial and Industrial Refrigeration Equipment Mfg. 3585 Other Motor Vehicle Parts Mfg. 3586 Measuring and Dispensing Pump Mfg. 3589 Other Commercial and Service Industry Machinery Mfg. 3592 Motor Vehicle Gasoline Engine and Engine Parts Mfg. 3593 Fluid Power Cylinder and Actuator Mfg. 3594 Fluid Power Pump and Motor Mfg. 3596 Scale and Balance Mfg. 3612 Power, Distribution, and Specialty Transformer Mfg. 3613 Switchgear and Switchboard Apparatus Mfg. 3621 Motor and Generator Mfg. 3624 Carbon and Graphite Product Mfg. 3625 Relay and Industrial Control Mfg. 3629 All Other Misc. Electrical Equipment and Component Mfg. 3631 Household Cooking Appliance Mfg. 3632 Household Refrigerator and Home Freezer Mfg. 3633 Household Laundry Equipment Mfg. 3634 Small Electrical Appliance Mfg. 3639 Other Major Household Appliance Mfg. 3639 Other Industrial Machinery Mfg. 3641 Electric Lamp Bulb and Part Mfg. 3643 Current-Carrying Wiring Device Mfg. 3644 Noncurrent-Carrying Wiring Device Mfg. 3645 Residential Electric Lighting Fixture Mfg. 3646 Commercial, Industrial, and Institutional Electric Lighting Fixture Mfg. 3647 Motor Vehicle Electrical and Electronic Equipment Mfg. 3648 Other Lighting Equipment Mfg. 3651 Audio and Video Equipment Mfg. 3663 Radio and Television Broadcasting and Wireless Communications Equipment Mfg. 3669 Other Communications Equipment Mfg. 3671 Other Electronic Component Mfg. 3672 Bare Printed Circuit Board Mfg. 3674 Semiconductor and Related Device Mfg. 3675 Capacitor, Resistor, Coil, Transformer, and Other Inductor Mfg. 3676 Capacitor, Resistor, Coil, Transformer, and Other Inductor Mfg. 3677 Electronic Coil, Transformer, and Other Inductor Mfg. 3679 Other Electronic Component Mfg. 3679 Printed Circuit Assembly (Electronic Assembly) Mfg. 3695 Blank Magnetic and Optical Recording Media Mfg. 3699 All Other Misc. Electrical Equipment and Component Mfg. 3711 Heavy Duty Truck Mfg. 3711 Light Truck and Utility Vehicle Mfg. 3711 Motor Vehicle Body Mfg. 3714 Other Motor Vehicle Parts Mfg. 3714 Motor Vehicle Brake System Mfg. 3714 Motor Vehicle Transmission and Power Train Parts Mfg. 3714 Motor Vehicle Gasoline Engine and Engine Parts Mfg. 3724 Aircraft Engine and Engine Parts Mfg. 3728 Other Aircraft Parts and Auxiliary Equipment Mfg. 3743 Railroad Rolling Stock Mfg. 3751 Motorcycle, Bicycle, and Parts Mfg. 3761 Guided Missile and Space Vehicle Mfg. 3764 Guided Missile and Space Vehicle Propulsion Unit and Propulsion Unit Parts Mfg. 3769 Other Guided Missile and Space Vehicle Parts and Auxiliary Equipment Mfg. 3792 Travel Trailer and Camper Mfg. 3795 Military Armored Vehicle, Tank, and Tank Component Mfg. 3799 All Other Transportation Equipment Mfg. 3812 Search, Detection, Navigation, Guidance, Aeronautical, and Nautical System and Instrument Mfg. 3824 Totalizing Fluid Meter and Counting Device Mfg. 3826 Analytical Laboratory Instrument Mfg. 3827 Optical Instrument and Lens Mfg. 3829 Other Measuring and Controlling Device Mfg. 3841 Surgical and Medical Instrument Mfg. 3842 Surgical Appliance and Supplies Mfg. 3845 Dental Equipment and Supplies Mfg. 3845 Electromedical and Electrotherapeutic Apparatus Mfg. 3861 Photographic and Photocopying Equipment Mfg. 3861 Photographic Film, Paper, Plate, and Chemical Mfg. 3873 Other Measuring and Controlling Device Mfg. 3911 Jewelry and Silverware Mfg. 3914 Jewelry and Silverware Mfg. 3915 Jewelry and Silverware Mfg. 3942 Doll, Toy, and Game Mfg. 3944 Doll, Toy, and Game Mfg. 3944 Motorcycle, Bicycle, and Parts Mfg. 3949 Sporting and Athletic Goods Mfg. 3951 Office Supplies (Except Paper) Mfg. 3952 Office Supplies (Except Paper) Mfg. 3953 Office Supplies (Except Paper) Mfg. 3955 Office Supplies (Except Paper) Mfg. 3965 Fastener, Button, Needle, and Pin Mfg. 3991 Broom, Brush, and Mop Mfg. 3996 All Other Plastics Product Mfg. 3999 All Other Misc. Mfg. 3999 All Other Misc. Wood Product Mfg. 3999 All Other Misc. Fabricated Metal Product Mfg. 3999 All Other Misc. Chemical Product and Preparation Mfg. 3999 All Other Plastics Product Mfg. 6712 Offices of Bank Holding Cos.
6719 Offices of Other Holding Cos.
7389 All Other Misc. Chemical Product and Preparation Mfg. 7999 Other Performing Arts Cos.